Every year Yogyakarta gathers at Jogja National Museum for a contemporary art event called ART JOG. A melting pot of thoughts and ideas in the form of arts. That's how the organizer describes the event in a short sentence. It was more specific than that though. ART JOG is a comprehensive and elaborate celebration of every type of arts, from visual, to multidimensional to performing arts. 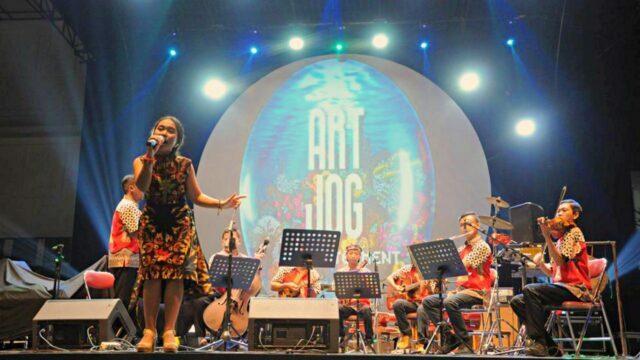 This event started in 2008 by the name of Jogja Art Fair. It was part of Yogyakarta Art Festival before becoming an independent exhibition in 2010. The name then changed into ART JOG. Being on its eleventh year this year, the public enthusiasm hasn't died down as it even increased. In 2018, the number of visitors reaches 65,000 people in total. It's an improvement after 60,000 visitors in 2017. At the beginning of each year, ART JOG holds an open call. This is how the event selects its contributors. All nationalities are welcomed to join. To adds diversity to the artworks exhibited. In 2018, 54 artists made it to the curation. 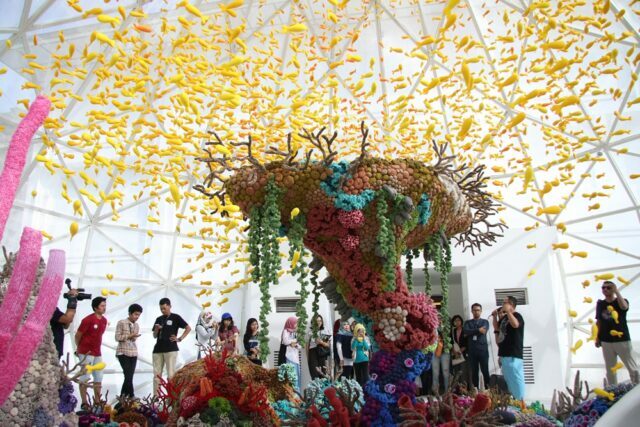 The lineup consisted of 45 Indonesian artists and 9 foreign artists. They came from the USA, Malaysia, Germany, China, and Australia. For 2019, the theme for ART JOG is "Arts in Common". It takes inspiration from a belief that artistic expression is a manifestation of creativity. Which basically every individual possesses. It means art as a universal language. This year's ART JOG plans to present art at a grass root level. Instead of making it something exclusive. The overall concept will be a friendly, down-to-earth exhibition that brings ART JOG to a broader audience. On typical days, the venue Jogja National Museum is a plain white-painted building. This changes during ART JOG. Under a program called Commission Work, the event collaborates with a featured artist. This project has one goal: to make the museum exterior far less boring. The result is installation arts that crawl on the museum wall. Enjoy sculptures stand on the front yard just by the entrance. Another installation art looms huge, attracting the attention of the passerby on the road nearby. This was it, another purpose of the project: to tell public that's there's currently a cool art fair inside. ART JOG displays a variety of arts for the exhibition. Relinquish artistic hunger by admiring over paintings, graphics, and photographs for classic visual arts. 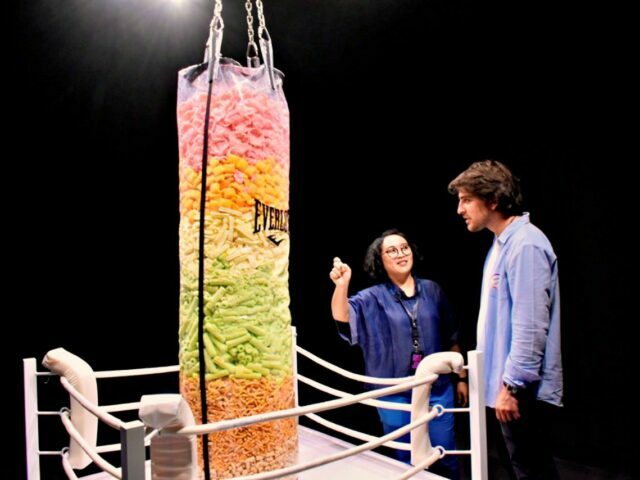 The contemporary multidimensional installations often use unusual media to tell a story. Some artist will be on the spot to answer and present their artwork. This type of arts attracts the most audience for its creativity. And in some cases, bizarreness. Admire, take pictures, but remember that no flash is allowed. It's nothing wrong to walk alone and get lost in examining a certain artwork's meaning. 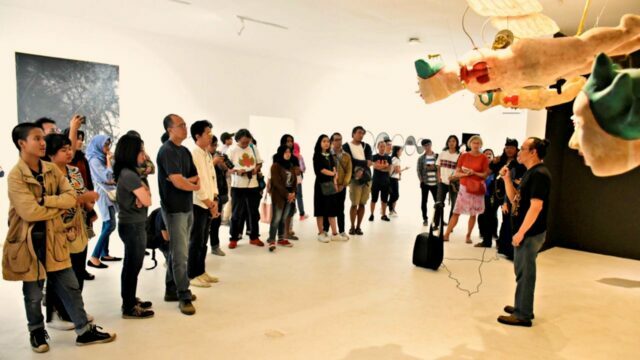 However, visitors can also join the curatorial tour offered by ART JOG. And discover that there's more to learn behind each art displayed here. The guide takes visitors around the gallery while pouring out interesting information. There will be many things to learn, stories to hear, new perspectives to reveal. Art presentation by the people behind the work. The meet and greet part of ART JOG bring artists and its audience even closer. Get to know more about the incredible men and women behind every artwork displayed here. Listen as they explain the artistic process behind their art creation. From the formulation of the idea to the implementation of it. A process which results in what visitors just saw at the exhibition hall. Certain art forms belong more on the stage than in the exhibition hall. This is why ART JOG also has a segment called Daily Performance. Every day during the event, artists entertain visitors with music, theater, and dance performance. The peak is during the closing ceremony. Where national musicians and singers come to rock the stage. 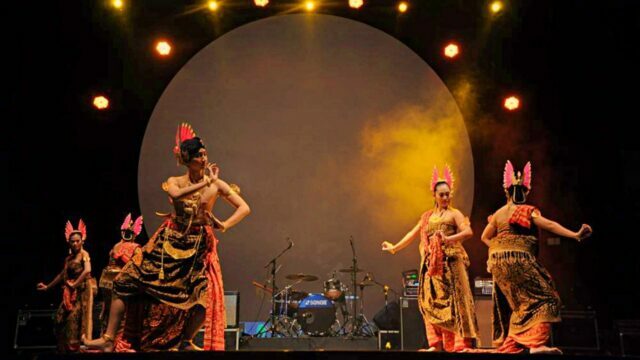 Live music performance along with traditional dance show will keep guests entertain. This segment of the event introduces art in a more practical form. The contributor for Merchandise Project are institutions, creative business, community, and artists. Merchandise Project showcases creative products and markets them to the public. Thinking about a souvenir station? Then this event is where one should go. 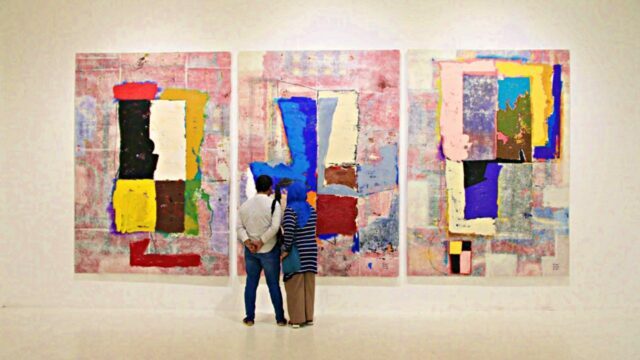 ART JOG 2019 will be held in Jogja National Museum. It is located close to Malioboro street. To be specific, at Professor Ki Amri Yahya Street No.1. The event starts from July 25th to August 25th, 2019. See: The Royal Water Castle Taman Sari, Entrance Fee & Guide. The event is free to visit for the opening day. Afterward, there is a ticket of IDR 50k/ visitor. Only valid for one-day entry to the event. See: Beringharjo Market, Tips & Guide to Explore Yogyakarta Number 1 Market. The venue, Jogja National Museum, is equipped with basic facilities such as parking and toilets. For food and drink, event attendees can visit the museum canteen. At the back of the building. For accommodation, there are hotels around the corner. Rates range from IDR 160k/night for a room at EDU hostel nearby, to IDR 750k for a room at Cavinton Hotel. From Adi Sucipto Airport, visitors can take Trans Jogja route Corridor 1B to get to the venue. The closest shelter is TP Bhayangkara shelter. Then walk for around 13 minutes (800 m) to the location. For another option, visitors can take the Corridor 3B bus from the airport. Then change to bus Corridor 2B at Gombor Terminal. Stop at SMA Bhayangkara Shelter and walk 350 m to the location. From Yogyakarta's Tugu Station, ART JOG is also reachable by taking a bus. First, head towards Malioboro and find a bus shelter there. Hop into Corridor 3B bus and get off at KH. Ahmad Dahlan bus shelter. Afterward, visitors still need to walk 400 m more. Don't forget to prepare small notes for the bus trip (a ticket is IDR 3500/ passenger).